Cotton is mainly composed of cellulose substance also found in other textile fibres. The body of the fibre may be broadly divided into four types. (1)Cuticle (2)Primary Wall (3)Secondary Wall (4)Lumen. The outside of the cotton fibre is covered with thin film of cuticle, it plays major role in the surface qualities of the fibre, influencing spinning and yarn properties. Cuticle consists of wax and pectic material along with some mineral matter. The primary wall of the young cell which becomes the outer skin of the matured fibres is composed of tiny threads of fibres that resist the action of acids and other solvents for cellulose. The circular threads are arranged to produce high strength and restrict fibre swelling. 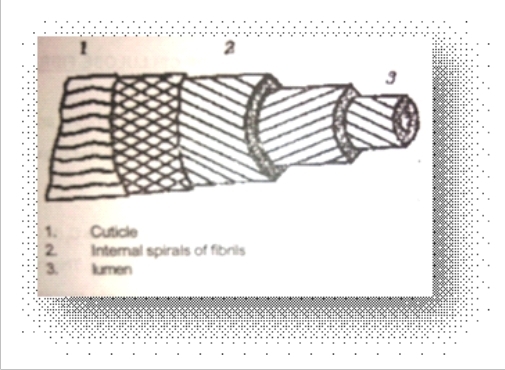 It is composed of successive layers of cellulose deposited on the inner side of the primary wall, without altering the original cell diameter.These layers are clearly visible in swollen fibre.The fibres are aligned side by side in each growth ring and are running spirally arranged about the longitudinal axis of the fibre. The lumen varies in dimension.Mature fibres may be fully developed to completely close the lumen. The lumen in mature fibres looks like a solid rod without any central canal, while in immature fibres the lumen appears as a very thin line. The lumen often contains the material protoplasm left when the fibre dries on maturity. It runs length ways through the fibre. Cotton is mainly composed of cellulose, cellulose belongs to an important group of organic compounds known as “Carbohydrates” this group includes sugar, starch, etc.. They contain Hydrogen, Oxygen and Carbon. 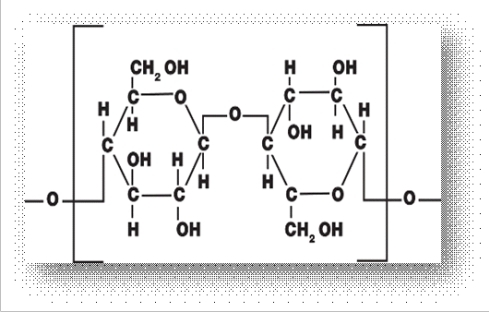 Glucose having chemical formula C₆H₁₂O₆ can be written as C₆(H₂O)₆, each molecule of glucose contains 6 carbons, 12 hydrogen’s and 6 oxygen atoms. This molecules react with other one and “Cellobiose”. Two such cellobiose molecule can combined together (with elimination of water) and thus forms a big molecule structure. The number of repeating units is called the chain length or the ‘Degree of Polymerisation. The degree of polymerization of cotton is as large as 4000. Cellulose is also a major component of wood as well as cotton and other textile fibers such as linen, hemp, and jute (ramie). For this reason, cellulose has always played an important role in the life of man, and its applications could even represent a landmark in the understanding of human evolution. Both fine lingerie and rough cottons have been recovered from the tombs of Egyptian pharaohs. Methods for the fabrication of cellulose substrates for writing and printing go back to the early Chinese dynasties. Cellulose and its derivatives are one of the principal materials of use for industrial exploitation (paper, nitrocellulose, cellulose acetate, methyl cellulose, carboxymethyl cellulose, etc.) and they represent a considerable economic investment.